Touch My Katamari contains the closest thing to innovation that the series has seen since Katamari Damacy rolled out in 2004. When that slice of progress is the ability to squish your ball of junk in two directions, it’s a telling reminder of how stagnant things have been for the Prince. Fortunately, that morphing ability is surprisingly more than just a gimmick to show off the Vita’s touchscreen — it actually makes the game’s ball-rolling action feel fresh again. One of the previously unavoidable things about katamari rolling is that picking up junk created a dilemma. While it was nice to grow and be able to pick up larger items (and a huge part of the concept, as it turns out), the additional bulk made it impossible to squeeze into previously accessible areas. In Touch My Katamari, the Prince can now morph the ball vertically or horizontally, which solves that issue. It sounded silly until I experience how useful it was. Drawing my two fingers apart on the touchscreen pulled the ball into a rolling-pin shape, perfect for sliding under beds or spanning the width of a street. In the katamari’s vertical configuration (think bicycle wheel), it’s easy to slip inside doorways or wind between obstacles. I found myself routinely switching shapes throughout levels, and it quickly became second nature. After playing through Touch My Katamari, I don’t know how easy going back to pre-morph versions will be. The game delivers most of the Katamari experience that you’d expect. The King of All Cosmos is there in all of his weird, vaguely sexualized glory. Barely related, barely animated cutscenes bridge levels, though they seem more desperately weird than naively quirky at this point in the series’ lifespan. The soundtrack is predictably solid, with peppy tunes accompanying the screams of little people who don’t much want to be rolled into a ball. Best of all, the Vita’s twin sticks control like a dream. Touch My Katamari is just about everything I’d hoped for, and not just for a handheld version of katamari. I was a bit disappointed that it doesn’t deliver the satisfying finale that I’ve grown accustomed to (continents, landmasses, and stars don’t get rolled up in game’s final moments), but it offers enough other things to soften the blow. The game provides a nice incentive to replay levels, either by trying to max out scores or through unlockable twists such as a faster katamari. There is also a host of leaderboards and connected features for those who like to compete (or collaborate) with friends. 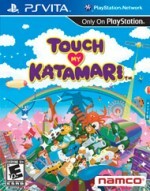 If you never clicked with the series’ ball-rolling insanity, Touch My Katamari isn’t likely to win you over. However, I do think that the morphing is a significant enough tweak to warrant giving it another shot. Touch My Katamari contains the closest thing to innovation that the series has seen since Katamari Damacy rolled out in 2004.